With many servers comes more and more complex systems and the need to manage a web of interdependencies. The following describes a setup I have employed that we have come to see as invaluable. OpenSSH is an incredibly powerful piece of software, and by default most of its features are barely utilized. Each of the following sections shows how to add more juice to a standard OpenSSH setup, and each gets progressively closer to our goal: effortless, encrypted, authentication and communication between Linux servers. This is the default way ssh handles authentication. A user is asked for his/her password on remotebox, the password is transmitted encrypted over the wire, checked against the remotebox database, and voila: remotebox shell. - Very secure, have to re-authenticate with every new connection. - Have to re-authenticate with every new connection. - Unattended cron jobs and scripts are a problem since we need a password. SSH also supports authentication using shared keys. We generate a pair of keys, one private and one public. When we attempt to authenticate, remotebox generates a random number and encrypts it using our public key (that is all a public key is good for). This is sent back to us, and if we can successfully decrypt it using our private key, we have proven we are who we say we are. OpenSSH supports RSA and/or DSA authentication (SSH1 and SSH2) using shared keys. We generate our keys using the ssh-keygen program. We will generate a DSA key, which requires SSH2. Also, make sure NOT to take the easy way out. Do NOT create a key with no passphrase (this will be explained later). Now, when we concatenate the id_dsa.pub to a user's ~/.ssh/authorized_keys2 file on remotebox, (authorized_keys for rsa keys), we will be able to connect to that machine as that user. - Still secure, have to re-authenticate with every new connection. - Still inconvenient, have to re-authenticate with every new connection. If we had not entered a passphrase above, our private key would not be encrypted. This is an easy way to avoid having to re-enter a passphrase with every connection, and is one way to setup for unattended cron tasks between machines. But it also means that if our localbox is hacked, the hacker would be able to skate into any remote boxes we had access to. By entering a passphrase, we encrypt the private key so it is safer to store on our disk. If our box is hacked, it is still a significant obstacle to actually use the key to impersonate us and gain access to other hosts having our public key. Unfortunately, if we do things the "right" way, the result is still largely the same as the default password setup... we are entering a passphrase for every new connection. The output of ssh-agent is a series of bash commands setting up environment variables. If we eval this command, these environment variables are exported to our shell. Now that ssh-agent knows about our key, we can access remote systems without a passphrase! - Finally we enter a passphrase only once. - New ssh-agent for each login session, meaning we have to re-run ssh-add, etc. - Cron jobs do not inherit the necessary environment variables and cannot contact ssh-agent. - Finally, re-authentication is rare. - Make sure private keys are on a well-protected box. Subsequent logins do not ever have to re-enter the passphrase in this setup. We have reached our goal... now let's surpass it. From the ssh_config manpage: Agent forwarding should be enabled with caution. Users with the ability to bypass file permissions on the remote host (for the agentâ€™s Unix-domain socket) can access the local agent through the forwarded connection. An attacker cannot obtain key material from the agent, however they can perform operations on the keys that enable them to authenticate using the identities loaded into the agent. 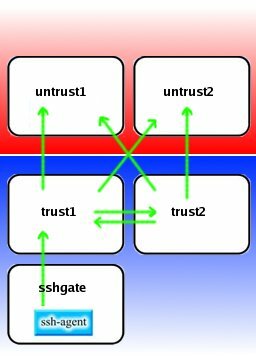 If untrust1 is not a forwarding agent, it means nothing if our connection TO untrust1 was FROM a forwarding agent: the ssh-agent socket file from sshgate (or an intermediary forwarding agent) is dumped into untrust1's /tmp. 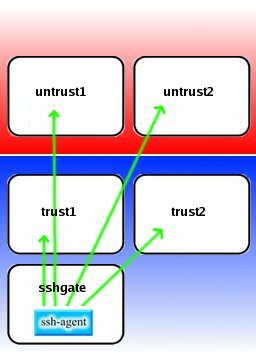 Make sure the ssh_config file on sshgate (and any intermediary forwarding agents) specifies that connections to untrust1 should not be forwarded with a Host declaration indicating such. Keychain only needs to run on one box, also setup as a forwarding agent. Other trusted boxes receive only the public key, but are also forwarding agents. Untrusted hosts receive only our public key, and these are not forwarding agents. - All of the above goals. - Minimal exposure of ssh-agent, avoiding possibility, however remote, of decrypted keys being extracted from untrusted hosts. - Minimal configuration on each host. - We can bounce from host to host within our trust domain! - As always, the Keychain box must be kept secure. */2 * * * * root source /root/.ssh-agent; ssh root@somehost "/some/script/somewhere"
Strict iptables rules only allow incoming connections for SSH, and perhaps DNS from specified hosts (no spoofing). Perhaps paranoid iptables rules allowing connections from a finite list of hosts. Users log into a custom shell that only allows a handful of commands. Root access closely guarded. SELinux to harden the machine. These measures are beyond the scope of this document, but should be strongly considered. Some possibilities with SELinux:users have no direct access to their own private keys, no access to some /etc files, etc. Very powerful... and doable. We have run variations on the above theme for years. No matter what measures you put in place, users will always be the weakest link, and they need to be made well aware of the implications. In many ways, we have created a castle gate. If an intruder sneaks through our gate, he/she is not likely to spend a lot of time trying to sabotage the gate, since it is armored, guarded, heavily fortified, and of comparably little interest. Of far more interest is what lies beyond the gate to which he/she now has full access.